While every seat in the Country Tonite Theatre offers a fantastic view of the stage, you can find the best seat availability for our Christmas Shows by booking in advance! Whether you prefer to sit up close to see the brightly decorated holiday sets or toward the back for a sweeping view of the stage, you can find just the seat you want by reserving your tickets now! 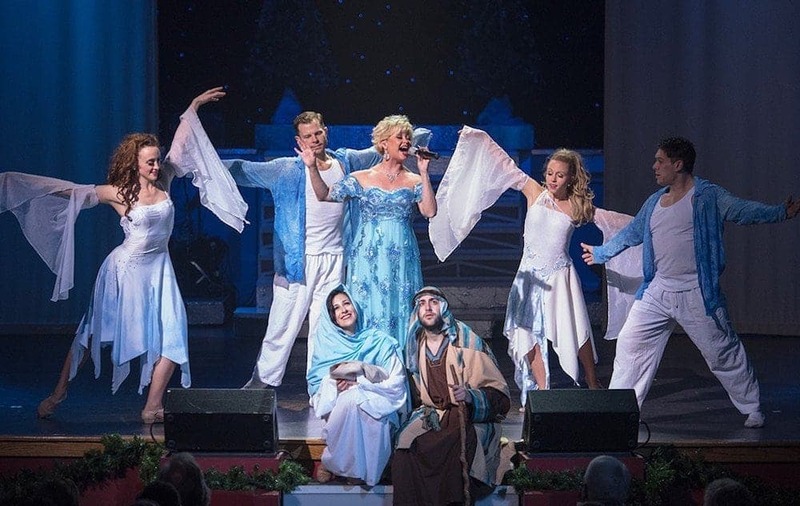 Our Christmas Show runs almost daily throughout November and December, with some dates featuring 2 performances. As soon as you know when you will be visiting Pigeon Forge, simply purchase your Country Tonite Christmas Show tickets online. As a bonus, you will save $5.00 per ticket for booking online! If you are planning on attending one of our Christmas performances with a group, check out our group reservation form and a representative from Country Tonite will contact you regarding your group reservation. There is just something special about being one of the first audience members to see the Christmas Show at Country Tonite! With our shows starting on November 1, you can put yourself into the holiday spirit earlier than ever this year! Our Christmas Show features a talented cast who covers all of your favorite holiday classics for a spirited holiday celebration for all ages! The show also features beautiful choreography, colorful costumes and even special guests performers such as Frosty the Snowman, the Sugar Plum Fairy and or course Santa Claus! Bring the entire family out to be one of the first guests to see the Country Tonite Christmas Show! Another great reason to purchase tickets now for our Christmas Show in Pigeon Forge is because they make a perfect Christmas gift for your family and friends! You can treat your family members to an early Christmas present by attending one of our holiday performances in November or early December, or wait until Christmas Day to present your tickets! Although Country Tonite is closed on Christmas Day so that our staff and performers can enjoy the holiday with their families, we have shows from December 26 to December 30 at 8 p.m. each night. We also have a special New Year’s Eve performance on December 31 at 9:45 p.m.! Check out all of the information about our Christmas Show in Pigeon Forge today to learn more and to purchase tickets for one of our upcoming performances! We hope to see you soon at Country Tonite!